Manchester is located at the foot of the 3,816’ high Mt. Equinox and is situated on Route 7A south. The village of Manchester has an old world atmosphere though Manchester Center is a shopper’s paradise! 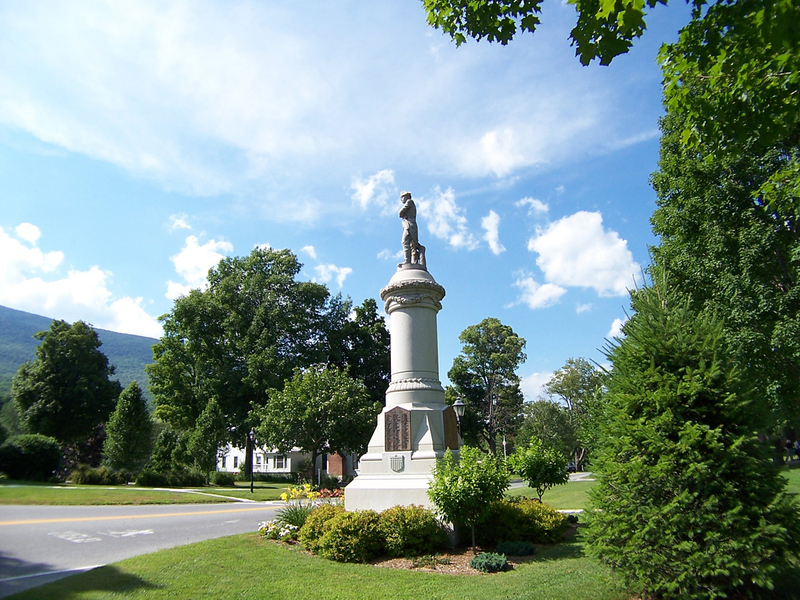 It’s located in the southwestern corner of Vermont state, and is situated midway between Bennington and Rutland. The village has enjoyed being the exclusive destination for the rich and famous. The summer home of Robert Todd Lincoln, the son of President Abraham Lincoln, is located here. Apart from the abundance of history and richness of beauty, Manchester serves as a shopping destination for those who are interested in its renowned Factory Outlet Stores, Antique Shops, and the region’s traditional quaint New England shops. Manchester offers dozens of fashion outlets and specialty stores, which have greatly helped make Manchester a shopping destination and regional tourist attraction. Visitors enjoy the beauty of Manchester to their heart’s content, as it offers a rich blend of cultural activity, fine or casual dining, diverse lodging, great shopping, and is in close proximity to all Vermont sports and recreation venues. There is something for everyone, as they say—from historical monuments to the art institutes, and from indoor sports recreational activities to the breathtakingly beautiful fly-fishing that is one-of-its-kind in the world! Alike to the town of Bennington, Manchester also enjoys a rich history and the events that led to the settlement of this locality. The town of Manchester was organized in March 1766, though the first settlement was made here around the summer of 1764, in the part of the town now known as the Purdy District. The events that occurred around 1776 were almost troublesome and unfortunate for the pioneers of Manchester—it was hard for the locals to relax and try to develop their area. But, after the important events of the year 1776-77 were passed, there was hardly any active defensive or aggressive military operation in the town of Manchester. With the close of the Revolution and the extinguishment of British rule in America, the inhabitants on the grants were at liberty to resume their accustomed labors; and moreover, New York did not seem that much interested in claiming its authority over the Green Mountain region. This allowed the development of Manchester and it continues to grow and expand its appeal to the locals and the visitors alike! Hildene was home to Abraham Lincoln’s descendants until 1975. This mansion is open to the visitors year round, and you can enjoy the music of organ and beauty of gardens. The art center is a non-profit educational institution, and is located on a beautiful 407 acre estate listed on the National Register of Historic Places. One of the best places to visit and enjoy learning the art of local community! The department offers an outdoor swimming pool, tennis and basketball courts, baseball and soccer fields, a sand volley-ball court, horseshoe pits, a children’s playground, and an outdoor ice skating rink. It is one of the best recreational points for people who live in Manchester or come here as visitors. The programs offered by the department are open throughout the year. It is an indoor playground and discovery place for children up to 5 years old, which offers classes, parties, and open gym. Parents love to watch their child move and explore, and know the strengths and weaknesses of their children. The Museum, as clear from the name itself, is a one-of-a-kind institution and offers the largest collection of fly-fishing artifacts in the world. The collection includes the tackle of many famous Americans. If you fly-fishing, this would be the place for you to visit! It is a non-profit, member-supported environmental education organization and provides programs for schools and the public. It also offers opportunities for citizens to participate in ecological research projects.